Remember some of the biggest companies of the last thirty years? We bet you had a Nintendo game system, complete with Super Mario Bros. and Duck Hunt games. You probably went to Blockbuster on Friday nights. You probably had a Blackberry phone and marveled at the ability to simply check your email by phone. All these things were so amazing that they couldn’t possibly be improved upon, right? Well, they hoped. As they were working hard to keep improving the current product, other companies were creating products to enter the market space consumers didn’t even realized existed…until, of course, those products were available. Who even knew at the time Netflix was introduced that buyers would prefer to receive their DVDs right to their mailbox instead of buckling up and traveling to their local video store? Let’s say for a minute that you’re the owner of Blockbuster, circa 1997. At this moment in time, you have no idea that the end is nigh. While you’re still expanding your brick-and-mortar locations, raking in the cash, you have no reason to expect that a company is forming in California that will one day become the very biggest name in in-home entertainment. And how could you expect that? Even after you got wind that there’s a mail-order DVD rental company out there, you discover they only have fewer than 1000 titles available. How could that compete with the vast library you offer? Plus, people have to wait for their rentals to arrive in the mail. What if people want to watch a movie now? Someone somewhere should have seen this coming. Too often, companies are so involved in improving their current offers that they’re not looking for disruptive innovations that could make their new-and-improved products obsolete. How could Blockbuster have known? More importantly, how could you possibly know what technologies are already patented that might present disruption to your business? Have you analyzed every piece of patent data available to identify innovation—even if it doesn’t seem to apply to your specific market share at this exact moment in time? The wrong time to start examining potentially disruptive innovations is when you’re already losing market share. At that point, you have two choices: disrupt your own business or hang on by the fingernails until you go under. Patent data gives us visibility into what other companies are doing—what technologies are being developed or enhanced and what disruptive innovations are being created. 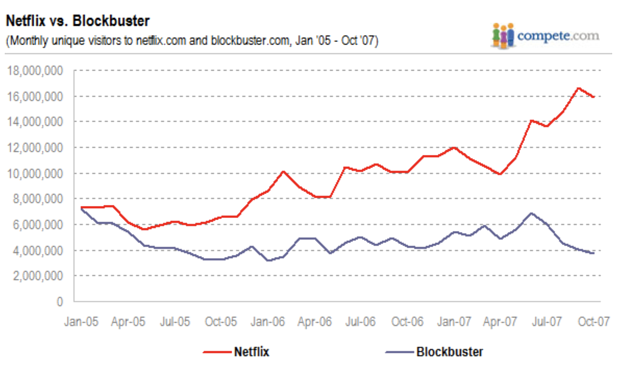 Using Blockbuster and Netflix again as examples, we saw them both attempt disruption, with one clear winner. While Blockbuster followed the DVD-by-mail model, along with the confusing sales of printers and other movie-unrelated electronics, Netflix was working on their next transformation. The problem was that, instead of examining the IP landscape to see where space existed for Blockbuster to regain market share, they tripped after Netflix with an imitation of the original idea. Meanwhile, Netflix was paving the way to ridding that pesky wait time between want and have by developing home streaming services. Blockbuster had just gotten settled in with their mail-order system when Netflix ripped the rug right out from under them again. With a deep dive into the intellectual property landscape surrounding home entertainment—and not just video rental services—Blockbuster might have seen the innovation occurring in time to disrupt their own business with new technology. Netflix wasn’t the only technology to push the video rental giant out of the picture. Investigation would have found Apple and Amazon working their way into streaming services, too. Even RedBox, the sidewalk rental vending machine found near grocery stores and fast food outlets, took its own part of the Blockbuster market share. Each of the examples listed above faced similar situations to Blockbuster. Nintendo made way for Sega (though they did get a little of their market share back with the release of the Wii, so kudos to them for creating a new market space), and Blackberry finally had to admit defeat at the hands of the iPhone. We see it every day with some of the biggest brands out there, but it doesn’t have to happen to you. Start now. Not when you feel you’re losing ground with your buyers due to copycat companies or disruptors. Learn what potentially disruptive innovations are already in the works by examining the IP landscape. Consider how those businesses will change the way you provide for your buyers. 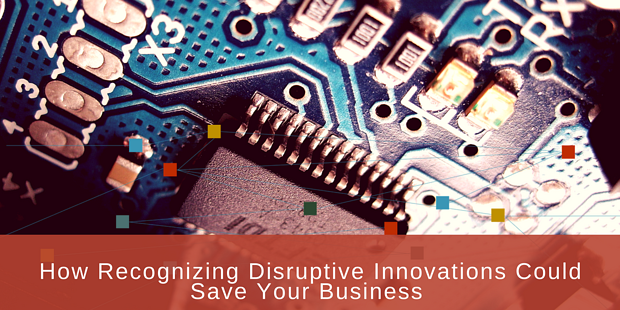 Then develop your own disruptive innovations. You can do this, and we can help.